The educational science animation introduces candle by explaining what a wick is made up of and types of wax, then it detail at the process of burning of the candle. An inside view of chemistry of candle is also given. This K8 –K12 animated chemistry software gives in-depth information about how candle works and is very useful for teachers and candle making industry. What is a candle made up of? How does wax produces flames when burnt? Which are the chemical substances used in preparing a candle? What are wax and stearic acid? Candle : We light a candle by touching a flame to the end of the wick. At first the wick itself starts to burn. The flame creeps down the sides of the wick and usually diminishes until it touches the wax. The heat from the flame melts the wax surrounding the base of the wick directly beneath it and then the mechanism starts. 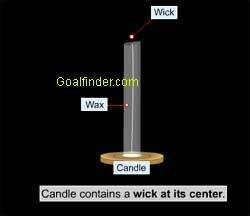 Wick : In all candles it acts as a fuel pump, supplying liquefied wax up to the top, wick is the most important element of the candle. Chemistry of Candle: Candles are made from mixture of paraffin wax and slow burning substance like stearic acid. Ans: Onions release fumes of sulphuric acid gas that interacts with anything moist including the eyes to irritate them, so freezing onions or cutting them in a pan filled with water does away with the emission also having a fire, such as a candle, will help as the heat and flames will draw in the onion gas, burn it, and then send it up with the rest of the flame exhausts. In the heat, the chemical reaction changes it such that it no longer irritates the eyes. Ans: What is the trick in the “trick candle”? When a person blows it out, it simply re-lights itself. In a normal candle, there is a burning ember (red portion) in the wick that causes a ribbon of paraffin smoke to rise from the wick. That ember is hot enough to vaporize paraffin but it is not hot enough to ignite the paraffin vapor. It needs something that burns producing a higher temperature. We add magnesium to wick; it burns rapidly at an ignition temperature of 800 deg F (430 deg C), the tiny sparks of magnesium re-ignite paraffin vapor, to light up the candle. The magnesium in the rest of the wick doesn't burn because the liquid paraffin isolates it from oxygen and keeps it cool. This is similar to a dynamite fuse except the quantity of magnesium is much less in candle. Ans: Invention of light bulb has a history prior to Edison’s “development” of electric bulb in 1879. In 1854 - Henricg Globel, invented the first true light bulb using a carbonized bamboo filament placed inside a glass bulb, the first electric arc light was invented in 1809 by Humphry Davy, he connected two wires to a battery and attached a charcoal strip between them. The charged carbon glowed on passing the current. In 1820 Warren De la Rue put a platinum coil in an evacuated tube and made it glow. Ans: Stars are massive bodies of plasma (ionic gas - hydrogen whose nucleus has separated from its electron) in space, producing their own energy through nuclear fusion. They are in hydrostatic equilibrium (contained in by gravity) so do not explode. Look at our “nuclear fusion in Sun” animation for more info. Stars allow us to look into the past, light coming from nearest Star “Sun” takes 8 minutes and from Alpha Centauri takes 4.3 years and tells us what they looked like 8 minutes or 4.3 years ago. Ans: A candle can, its flame can't ;) to burn a candle or for that matter any combustible material oxygen is needed ( for oxidation of carbon), in absence of air a candle cannot produce a flame.